We’ve got another Tokyopop debut series to look at this week, and a mix of debuts and continuing series from Yen Press and Viz Media as well. MICHELLE: You have my deepest condolences. MICHELLE: I tend to generally not like bread-like items with things in them. That said, I was a kid the last time I tried it so would give it another chance. Can you say the same about the manga you read this week? MELINDA: Hmmmm, well, not quite. Or, I should say, “not necessary.” But I’m guessing you can? MICHELLE: More like a “probably not” and a “this one was on its third chance already” kind of thing. :) But first, the former! Unfortunately, despite the cracktastic potential suggested by that phrase, the story as presented in the first volume is exceedingly dull. Wealthy Tatsuya Tsugawa has lost both his parents the week before, and yet seems largely unaffected by this aside from trying to live up to his dying father’s wish that he become a great man. This compels him to intervene when he notices a classmate, Miyazaki, being bullied. She tells him several times that she wants the bullying to continue, but he can’t leave her alone and eventually learns that she was purposely antagonizing the bully the better to extract a parasite that was infecting her. Perhaps the story doesn’t seem so boring in summary form, but it really, really is. I lay most of the blame at the feet of Tsugawa, who is just so utterly generic that the only thing remarkable about him is the extent of his blandness. At the halfway point, when he questions why Miyazaki’s opinion matters to him and wonders if this means that he likes her, I quite literally set the book aside and had a brief nap. That’s how believable and meaningful the scene was. Tsugawa and Miyazaki interact a few more times, with the inevitable result that she winds up moving in with him. Love and parasites will surely ensue, but man, I can’t imagine sitting through a second volume. MELINDA: I’ll admit the story doesn’t sound *so* boring in summary form, but your nap anecdote is difficult to ignore. Also, where are the mermaids? MICHELLE: An excellent question! I don’t recall a single mention of them. More vividly, I recall the half dozen grammar errors that plague the text. All in all, it’s not a very auspicious debut. Did you fare better with your picks this week? MELINDA: I did, particularly with my first selection, which I found quite charming. This week, I finally got around to picking up Julietta Suzuki’s Kamisama Kiss, a supernatural romantic comedy from Viz’s Shojo Beat imprint. 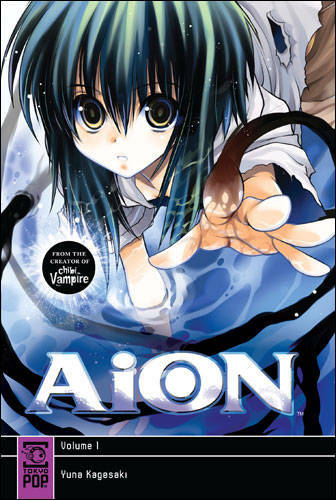 Like AION, this series begins with its protagonist, Nanami, being essentially orphaned, though in this case our teenaged heroine’s father has not actually died but skipped town to avoid his gambling debts, leaving his daughter to face the collectors all alone. Once she’s been evicted from her apartment, Nanami ends up in the park where she meets a strange man who offers her his home if she’ll take over his job. Before she knows what’s happening, he’s sent her on her way, but when Nanami reaches the home that’s been promised her, it turns out to be a shrine–of which she’s just been made god! An argument could be made that this premise sounds much less interesting than AION‘s as you’ve described it, but fortunately this one is well-executed and genuinely fun. Nanami’s cut from pretty standard shoujo cloth–a spunky young woman with no obvious talent aside from her determined optimism, but she’s got a great foil in the form of Tomoe, a fox (the supernatural kind, though the other kind too) who served the shrine’s former kami and who is beyond dismayed to find himself bound to someone like Nanami. Tomoe is catty and cynical but excellent at his job, and watching him work and argue with Nanami is the source of most of this volume’s charm. 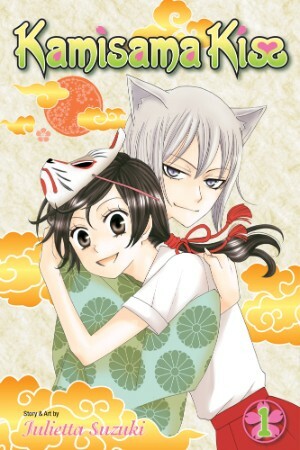 What I especially appreciate about this series, is that regardless of Tomoe’s tremendous superiority complex, he’s far too lazy to be controlling like so many shoujo love interests, and even his surliness is kept staunchly at bay thanks to Nanami’s power of kotodama, which forces him to do her bidding whether he wants to or not. In a way, Kamisama Kiss is everything that Black Bird could have been if not for its heavy misogynist overtones. Like Misao, Nanami’s surrounded by yokai who would just as soon eat her if they had the chance, but unlike Misao, Nanami has agency, and that makes all the difference in the world. MICHELLE: It’s interesting that you mention Black Bird, because I did the same in my recent review of Kamisama Kiss, though mine was more in the context of being worried about some of Tomoe’s comments as contrasted by his kindliness. You’re right about the kotodama giving Nanami an advantage, though—actually, this combined with Tomoe’s white ears puts me in mind of Kagome’s ability to compel InuYasha‘s titular hero to “Sit!”—so perhaps I oughtn’t be so concerned. MELINDA: It’s interesting to me that you had that concern, because this series didn’t ping me that way at all, and not just because of Nanami’s kotodama. Tomoe may be surly and condescending, but he’s expressed zero sexual interest in Nanami so far, and he thankfully lacks Kyo’s predatory lust and possessiveness, which is what makes Kyo so controlling and repulsive. Tomoe’s neither as clingy nor as abusive as Kyo, and though it seems clear that Tomoe and Nanami are being set up for romance, I feel like they’re starting on even ground, thanks to their individual strengths and weaknesses. So what else have you been reading this week? MICHELLE: You’ll be pleased to hear that the series to which I gave a third chance is Nabari No Ou! It’s very rare that you and I should disagree about a series, but it happened with this tale of a reluctant ninja. I found the first two volumes to be mighty boring, but I’m happy to report that things pick up a lot in volume three and stay pretty interesting through volume five! The basic gist of the plot is that a middle schooler named Miharu Rokujou is inhabited by an immense power known as the “Shinra Banshou,” and two factions of ninja clans are fighting over him. Both are after a set of five scrolls containing the “secret arts” of the various ninja clans, though one group thinks they can use these scrolls to dispel Shinra Banshou while the other seeks to activate it. In volume three, Miharu and his protectors (they of the “dispel” camp) accept a job to assassinate a scientist in exchange for one such scroll, which leads Miharu’s protector Kumohira-sensei to question his convictions and ultimately, to a chilling culmination of the assignment. 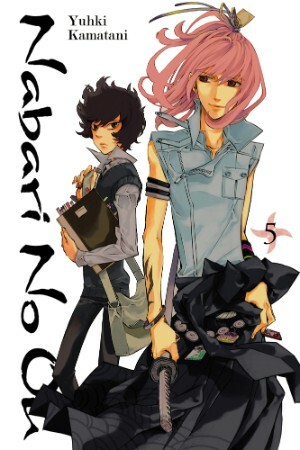 Volumes four and five deal primarily with the backstory for one of the characters’ brothers, and manage to sustain much of the momentum gained in volume three. Don’t get me wrong, I still yawn when reading about the squabbling clans or the all-powerful scrolls, but the characters and their relationships are what have piqued my interest at last. Largely this is facilitated by the head of a rival clan—the one who hired them for the assassination job—who possesses the ability to read minds and threatens to reveal everyone’s “grave secrets.” This gets everyone suspicious of one another, with some pretty dramatic results. I’m most interested in the dynamic between Miharu and Kumohira, because the latter seeks to obtain the former’s trust while revealing as little as possible about what he remembers of some cataclysmic past event, but I also quite like scenes between Miharu and Yoite, another young man who should be Miharu’s enemy but for whom he seems willing to do just about anything. I’m sure there is loads of fanfic written about these two. Anyway, I am finally on board the Nabari train. MELINDA: I am very pleased to hear this! I feel like this series has been the skeleton in the closet of our friendship! Or something like that. I agree that it’s the relationships that really make this series come alive, though I liked them earlier on than you did. Or maybe I just liked Miharu so much, I felt more patient about the rest. He’s the kind of enigma I enjoy most. I haven’t fully dug in to volume five yet, but now I’m really looking forward to it. I feel like I should have many smart questions to ask you, now that you’ve read further into the series, but I find I mainly just agree, particularly on your feelings about where the most interesting relationship drama currently resides. 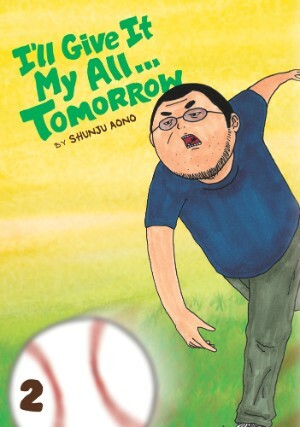 MELINDA: I’m a bit tardy on this one, but I’ve just finished the second volume of Shunjo Aono’s I’ll Give It My All… Tomorrow from Viz’s SigIKKI line. I enjoyed the first volume of this series, but my greatest concern at the time was that the series might quickly become unreadable if something didn’t change for its painfully lost protagonist. Fortunately, that pitfall has not yet come to pass, though not for the reasons one might imagine. The second volume finds Shizuo still plugging along in his half-hearted, humiliating way, creating bad manga that may never be accepted for publication, imagining romantic interest from a woman who is merely kind to him, and imposing on the few people who inexplicably care for him, including his daughter and his younger friend, Shuichi. A bit of backstory helps to put his stunted personality in perspective, but it’s truly agonizing to watch him fumble through life, especially should one catch a glimpse of oneself in Shizuo’s plight, which, believe you me, is uncomfortably easy for many of us to do. What really saves this volume, however, is that it miraculously develops a hero, and that hero is, surprisingly, Shuichi. Here’s a quiet, pretty much expressionless guy, who manages somehow in the least likely arena to display the kind of compassion and fearlessness one might expect from a shounen battle hero. I won’t spoil you by telling you what happens, but I will say that I actually cheered audibly at one point in this volume. Being a melancholy seinen comedy, Shuichi’s heroism doesn’t get him much but a messed up face and the loss of his job, but it’s still a damn good read. Of course, Shuichi isn’t actually the hero of this manga, and even now I find myself wondering how long the story’s premise can last without becoming too depressing to bear. But Aono’s won my confidence enough to compel me towards volume three, and that’s no small feat. MICHELLE: I haven’t even been able to work up the desire to give this series a first chance, much less a second or third. It just sounds so… horribly frustrating and bound to leave the reader depressed. Maybe it’s shallow of me, but I’d much rather read something utterly frivolous. MELINDA: It’s not necessarily an easy read, that’s for sure, though it is genuinely a comedy. It’s not self-consciously dark. MICHELLE: Yeah, but I have a history of finding unfunny series that others find very amusing, like Detroit Metal City. I think I’ll continue to stay away from this one. MICHELLE: It might take some time to muster up the nerve. MELINDA: So it’s often been said. MICHELLE: Many times, many ways? Many thanks to Michelle for indulging me in 22 installments of this feature since we first began back in August! Join us again in the new year for an all new Off the Shelf!